Do you use helm? Leave a review! Helm is an Emacs framework for incremental completions and narrowing selections. It provides an easy-to-use API for developers wishing to build their own Helm applications in Emacs, powerful search tools and dozens of already built-in commands providing completion to almost everything. It is a must-have for anyone using Emacs as a main work environment. Helm has been widely adopted by many Emacs power-users. It is available in Melpa and can be easily installed from the Emacs package manager. Maintaining Helm requires a lot of work, which I have done voluntarily since 2011.
maintaining it without financial help. but they are actually too few to continue serenely. only providing a minimal bugfix maintenance. Is it possible to change order of helm match results? How do I disable line numbers in Helm buffers? Emacs Helm Swoop error: "Symbol's value as variable is void: $buf"
Emacs - selecting a match from helm-multi-swoop-all produces the error "Symbol's value as variable is void: $buf"
What is a Sample in Helm? How do I merge signals in Helm? Can helm run different functions on multiple selections from different sources? emacs (org-mode/helm-google) open links in eww? how to bind helm-do-grep-1 to a key in emacs? Why does helm-locate work relatively slow for a small number of candidates? emacs ow can I helm-find with default directory pre-specified? Fixes #1973 and allow using make install to install Helm. 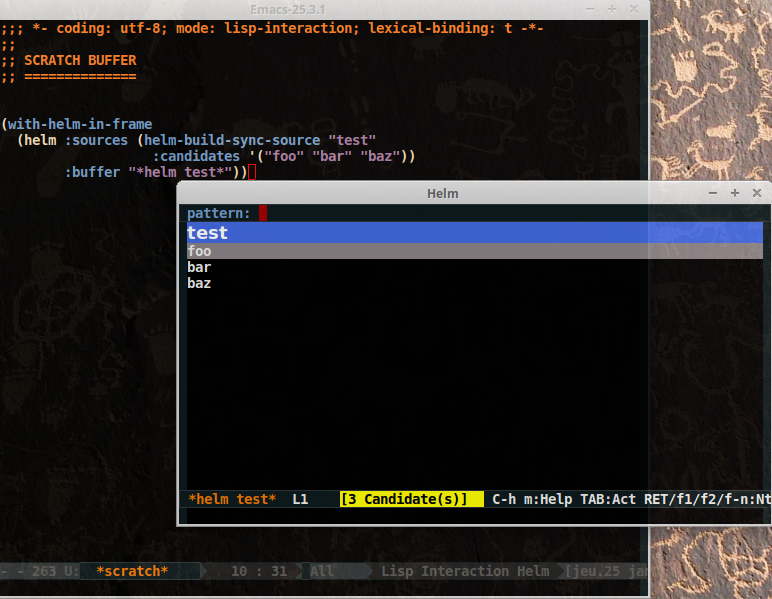 Helm is now doing initial update of helm-buffer before displaying it in its window. helm-boring-file-regexp-list format have changed, see its docstring. Improve inheritance of frame settings in helm actions. Diverse bug fixes as always. Note: There is a small bug included in this release (see #1973) which have been fixed. helm-apt have been removed, use helm-system-packages instead. Regexps in helm-boring-file-regexp-list have changed see its default value. helm-find-files is now faster when helm-ff-skip-boring-files is enabled. Various small bug fixes and small improvements as always. Keep up with changes to helm! Would you tell us more about helm?